Welcome to GiGi's Salon & Spa! We are excited to welcome you to our home in Ramsey, Minnesota. After working in the industry for many years, owners and sisters Ginger Edin and Gillian Rote decided to follow their dream and open an Aveda Concept salon. Every detail in their new space was designed with their guests experience in mind…in addition to a warm, inviting and beautiful feel. 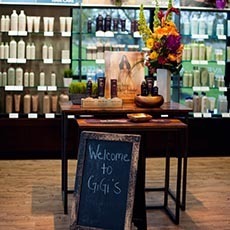 GiGi’s Salon & Spa is an Aveda Concept Salon that is truly an experience. We believe education is essential. All our staff is professionally trained and well versed in the Aveda line and can recommend the best products for you. Stop by and indulge in a complimentary cup of Aveda comforting tea, shop our full line of naturally derived Aveda products from skin care to hair, and see the strength behind our services. FREE Wifi is also available for our guests.